The Goshen School house was built in 1923 and was a consolidation of the Beidler and Goshen Hill Schools. Oliver Schumacher was the building contractor for the new brick school. At its dedication, the Ku Klux Klan were among attendees and can be seen in a photo of the event. (page 7 of the Recollections of a Community Part 1) Some of the teachers there were Lottie Nosker, Florence Rausch and Howard Hill. Mrs. Ida Howard was the first janitor there. Grades 1-8 were taught in the builidng which had three floors. The lower floor served as a cafeteria. Roberta Carlisle Warner, who now resides in Terra Haute, Indiana, remembered that everyone in Goshen was absolutely thrilled with the new school where many programs and activities were held. The school closed in the 1960’s and the community became part of the Indian Valley Schools consolidation. The building, owned by Bob Bair, remains today along Goshen Valley Rd. and is used as a storage facility. 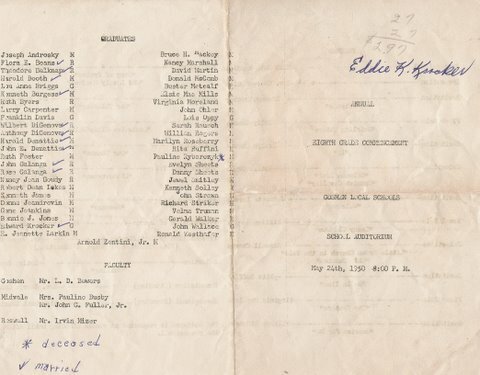 This is a program from the May 24, 1950 Eighth Grade Commencement at the Goshen Local School. It was found with a box of items from Kathryn Krocker. Her son Edward K. Krocker was a graduate.